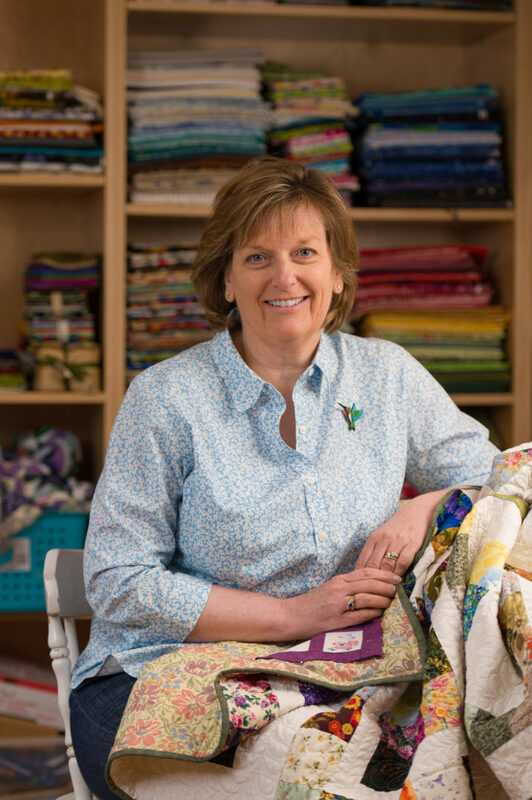 Author Joan Ford is the founder of the ScrapTherapy quilting program and teaches workshops and quilting classes throughout North America. Joan Ford’s latest book is out. This survival guide helps quilters of all skill levels to avoid common quilting errors and to work around them if they occur. Joan also suggests great quilts to make. 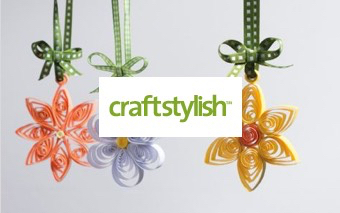 Joan is the founder of the ScrapTherapy quilting program and teaches workshops and quilting classes throughout North America. To celebrate the release of Joan’s book, we’ve included a free quilting download on our website for a fabulous recycled quilted tote. 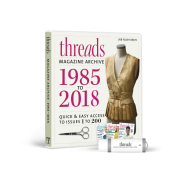 Threads magazine: What inspired you to write a book in this survival guide format? JF (Joan Ford): The idea started out as a suggestion from the editorial staff at The Taunton Press. A quilting version of the survival guide series seemed a perfect fit for my passion. I feel that quilting is a hobby that should have absolutely no guilt associated with it. I think, lots of times, quilters give up on a project because they hit a trouble spot. 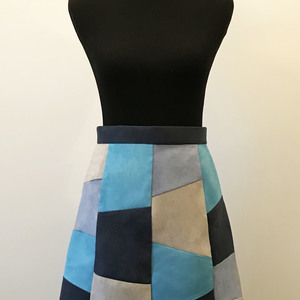 It’s easier, sometimes, to move on than to figure out a fix, which could be something as simple as changing a needle on the sewing machine or incorporating a different fabric color. But the cast-aside, unfinished projects don’t go away. As the unfinished objects pile up, so does the guilt. 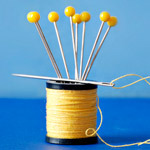 Of course, quilters are also subject to the ‘shiny new object’ syndrome having nothing to do with hitting a rough spot in the process, but maybe that’s another story for another day. This book also allowed me to reach out to some of my designer friends in the industry for their tips in specific areas of their expertise. 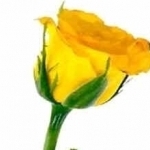 I heard directly from quilters in my online community who experienced real problems in their quilts, and I learned how they fixed or worked around the problems. Quilters are very resourceful. The book also left a little room for some humor. And really, when bad things happen, doesn’t it always create the chance to look back with a smile? It might not be so funny when the dog tears a hole in a wedding quilt, but applying a dog-bone shaped appliqué over the hole to commemorate the need for the repair allows for a little chuckle later on. Life happens to everyone, even when we’re making quilts! 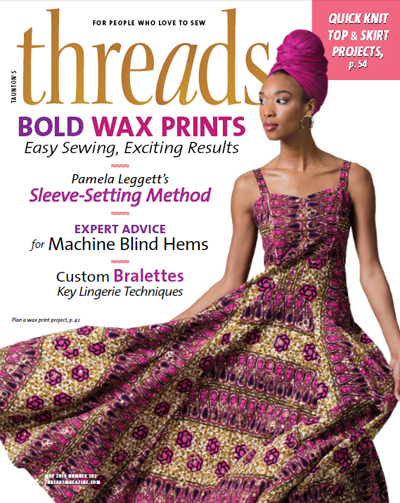 Threads: What’s the most common problem you run into when quilting? 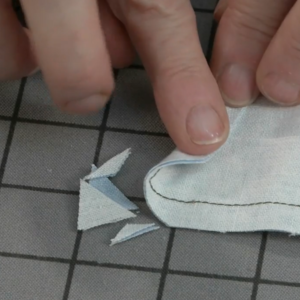 JF: When I teach, I think the problems I most often see are seam allowance errors. 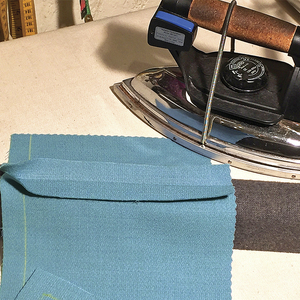 The scant quarter-inch seam is such a simple concept but may be surprisingly difficult to achieve exactly and consistently. 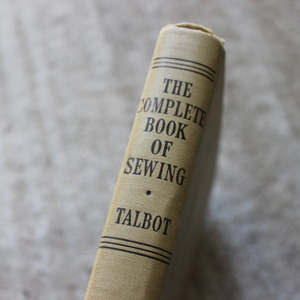 There are so many variables involved: the machine foot, the thread, the maker, even the sewing machine itself. With any concept, I think the first step in conquering the challenge is understanding it and determining the fix that works best for you. 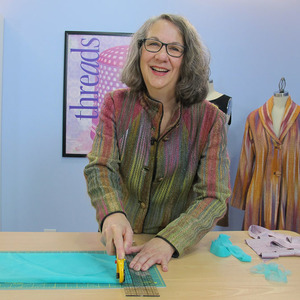 Threads: What is your best advice for a beginning quilter? JF: I think it’s important to learn the basics. Everyone has to walk before they can run. With social media offering tons and tons of resources, it’s fairly common to find beautiful specimens of exceptional piecing and quilting done by people who have been making quilts for a very long time, and then make comparisons. “I want MY quilt to look like that one,” they tell themselves. Try not to compare where you are at the very beginning of the process to where someone else is after making hundreds of quilts. You can achieve any level you want by learning, doing, experimenting, and understanding, but it takes time. And you’d be surprised how quickly you can pick up some of this quilting knowledge with just a little bit of mileage under the needle. I have always felt that everything in quilting is easy. You just have to figure out what tricks and tips work best for you, what pitfalls to avoid, and approach each new technique when you are ready for it. In any hobby, you can always find someone who has mastered the process better than you have. Rather than see that as a letdown, turn it into inspiration. 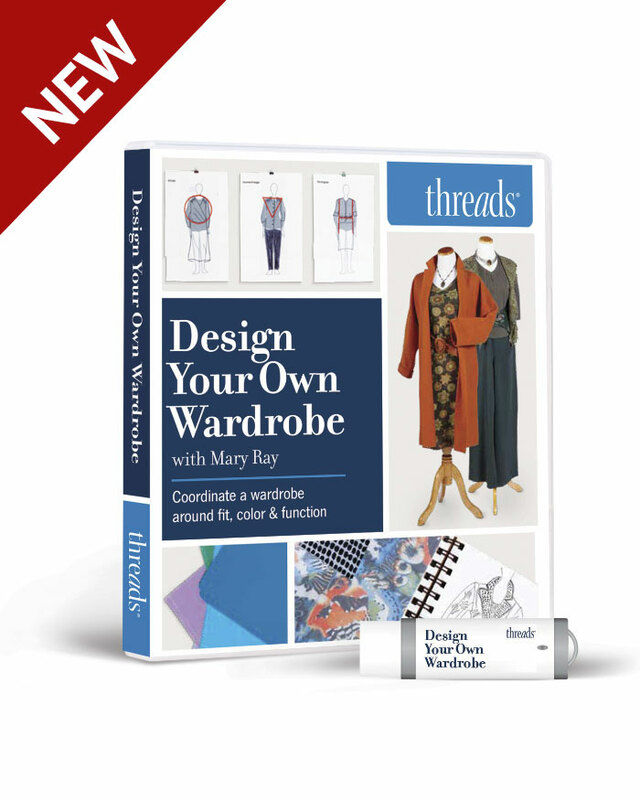 Threads: Where did you learn most of your tips and tricks (trial and error, a family member, guide books, etc.)? JF: When I was a kid, my mom sewed an occasional Halloween costume, or a hem, but she never used the sewing machine enough for me to consider it as something I might be interested in. There were no sewists in my family for inspiration. 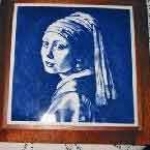 In fact, I opted out of the sewing class in high school to take a ceramics class. I never even touched a sewing machine until about two months after receiving my first machine as a gift in 2003. I worked a full-time job, came home, made dinner, and moved immediately to the dining room where I set up an ad hoc sewing studio. I couldn’t get enough! My whole day was ruined if I wasn’t able to sneak in a couple of four-patch seams before heading off to my daily commute. I took tons of classes at the local quilt shop to learn lots of techniques. I’ve always loved using gadgets, and I’ve tried plenty that I liked and plenty that I didn’t care for. And if a technique didn’t work for me, I tried to figure out why it wasn’t working. 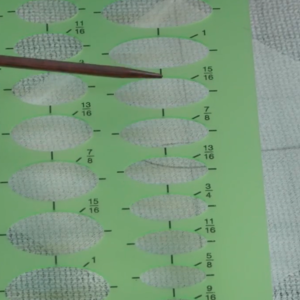 I was always looking for a little tweak in the pattern or technique that would make things a little easier or more accurate. Threads: What can readers look forward to seeing from you in the future? JF: It’s so hard to say because I like so many different quilting techniques. But scrappy quilts, I should say controlled scrappy quilts, are my favorite. I’ve been playing around with the many things you can do with nine-patch blocks, so maybe something in that direction is on deck. In some ways, I’m just as anxious to see what’s next as anyone else. There are so many paths to take, it’s tough to choose just one. For your chance to win a copy of Joan’s book, When Bad Things Happen to Good Quilters, tell us about the most common error you’ve made when quilting and any solutions you may have. Leave a comment below by 11:59 p.m. EST, April 3, 2015 to be eligible to win. The winner will be randomly selected, contacted via email and announced shortly thereafter. 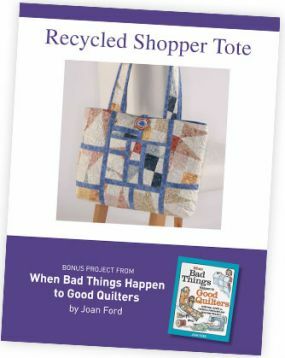 To celebrate the release of Joan’s book, we are happy to offer this bonus Recycled Shopper Tote project as a free download. 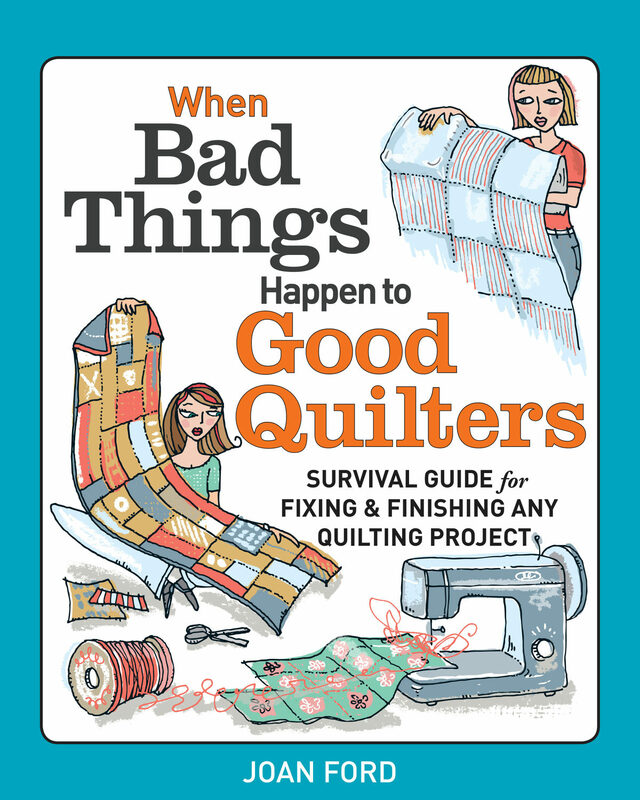 Preorder your copy of When Bad Things Happen to Good Quilters by Joan Ford (The Taunton Press, 2015) now. No matter how careful I am, the top measurement of the quilt is never the same as the bottom one. Even though I measure and carefully move my ruler, my strips never appear to be as straight as I think they should be. Paula K.
Can one be the king of mismatched seams? Sometimes I am in too much of a hurry to get a project done! I use a rotary cutter and have mistakenly cut the wrong fabric! I now clear my cutting table and make sure there are no unwanted folds or fabric under the piece I need to cut!!! Scant scares me. 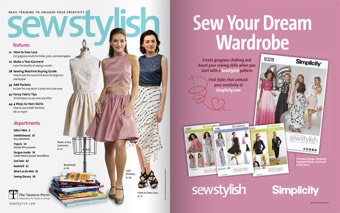 I read through the pattern and if the word appears I drop the idea of tackling the project. Any suggestions would be appreciated. 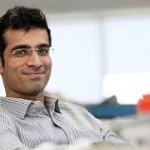 What is the backstory on scant. In metric countries do they use the word in patterns? 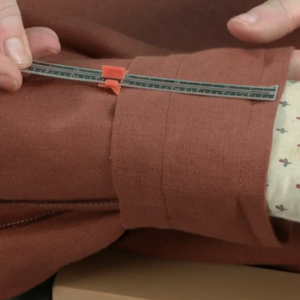 Never being able to cut and sew accurately enough. 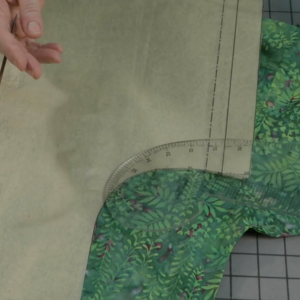 Being fairly new to quilting, I agree with Joan Ford that the scant 1/4 inch seam is the biggest concern (t least for me it is). Is it a thread-width off 1/4"? a 1/16th inch? or is there more involved? 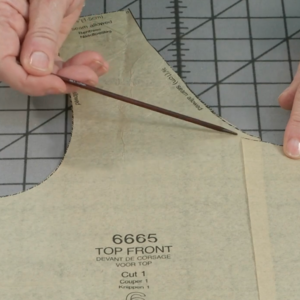 Is it easier to overcome differences in the seam size with hand-stitching? I am generally using my machine and watching the width of my presser foot to keep a 1/4 seam. And why not just use a real 1/4" for all the seam? I hope these questions are covered and answered in the book. Thanks. It seems like no matter how accurate I "think" my cutting, after I start sewing, check measurements, & find an error, it's usually the fabric & not the scant quarter inch seam that is the culprit! Getting the binding the same width all around was a real challenge on my last quilt. I think I cut it too narrow. Next time I'll give myself a little more "wrap around". Hope I win the book. Thanks. I sew crooked 1/4" seams and then the pieces don't match up and I lose the points. Consistent 1/4" and "measure twice, cut once" get me. I usually want to move too quickly to be meticulous enough to be consistent. I did a whole lap quilt over because I did not verify the size of my squares. I measure the fabric,find the center, cut off the salvage, mark it & cut it crooked, then start with a 1/4 'to no seam & end up the points don't match, can't seem to color corrianate my colors. It(The Quilt) looks like it belongs on the top of a "Circus Tent". And I took Sewing in School and got a "A'. My biggest error was to think all I needed was "good will". 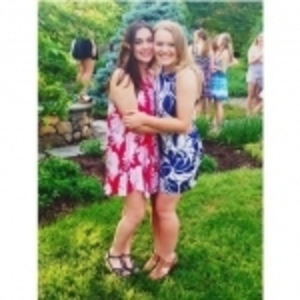 I soon realized I needed help, other people's experiences, and lots of time. I joined a class and feel that I can improve a little every week. 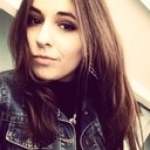 Your book would be so very welcome to help me along my learning path. my biggest problem if forgetting to check the blocks, sashing and borders as I go to make sure they are absolutely square. A small error early on compounds the problem. The fix of course is to measure and rip if necessary. I'd also like to know a solution to the problem of heavily quilting blocks between sashing which can cause the sashing to puff up a little and ruin the square of the piece ( because the corner piece becomes flat but the unquilted sashing is not). I don't have an inset table for my macine, or a bed extender, so it's hard to quilt because all I have is the macine's basic bed. Need more practice! Conquering that 1/4" seam allowance took years of study and massive amounts of tries. Finally figured out, it's the machines that aren't helping us. When manufacturers finally get it, most quilters won't have the problem. In the meantime, I have a $3 seam guide that's a miracle worker. My most common mistake doesn't happen now, I finally got used to it. I started out sewing clothing so I always backstitched! 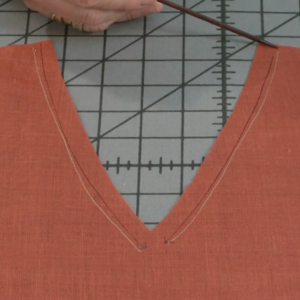 I tend to not straighten my fabric which makes strips cut the width of fabric sometimes come out v-shaped. Also, my rotary cutter seems to want to follow it's own path, not the edge of the ruler. I need better focus! I don't always square up my blocks or check to see that they are the correct size before sewing them together. I do exactly what Joan says--I look at the experts and say, "that's what I want my quilt to look like." And it never does and so I stop working on the quilt. Sometimes I cover the machine and walk away for months. :( I guess the solution is the same as everything else in life--do the job to the best of my ability and not worry what anyone thinks. I'm a great starter, but also a great non-finisher. Every now and then I decide no more starts until some projects get finished. Usually I decide that I must finish 2 UFO's before starting a new one and then finish that one and two more before starting the next one. That does whittle away at the UFO's for a while. I have trouble with the miters on corners. No matter how many times I try, the corners are not sharp. Getting mitered corners right, getting any "point" lined up right, like in a triangular shape, without a pouf somewhere, learning how to sew multiple strips together to be able to cut multiple shapes (squares or triangles) out at the same time (like in seminole sewiing), and sewing circular shapes is my biggest issue next to getting started and actually finishing a project! I have a hard time quilting after I sandwich the quilt. The fabric is never completely flat and it puckers or gathers at the bottom. I took some classes to learn how to fix this, but I need more practice on this. I find a project I absolutely must do, then I hit my stash to find the required fabrics only to discover I am a bit short of what I need! Aargh! The only remedy I can see for this dilemma is to do more fabric shopping! I love to quilt (and sew other things too) but have a hard time getting started. Too many other priorities and distractions. Once I get started, I am pretty good at finishing. My biggest error is in the actual quilting. I seem to have great difficulty with the bottom layer forming tucks as I quilt. I love quilting, just wish mine turned out like the quilts on display at the shop. I need lots of practice! I have trouble sewing matching points when sewing two blocks, each with multiple seams,together. I try to pin extra carefully and sometimes baste my two blocks together before I finally sew them to each other. This sounds great! always getting myself into a jam and would love help getting out!! Thanks so much! I don't have one most common error, I have many! Just to name a few: points not matching correctly, cutting errors, wandering seams, sewing the back of the fabric as if it were the front, going past the ¼ inch mark when I'm setting in patches, thread nests on the back while machine quilting,. But the solution for all of them is the same. Take my time! I'm not in a rush, I do this for my own pleasure, I enjoy almost all of the processes except for basting, and I rarely have a deadline. When I get a project finished it's exactly at the right time. So going slowly and patiently prevents almost all those errors. Measuring is always an issue! But the worst mistake I ever made was to sew another part of the quilt top into my seam, and not notice it until I had a tangled mess of fabric. 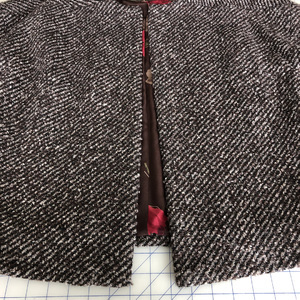 One of the first projects I tried I plunged ahead without out thinking it through - sewing the outer edge together is not a good idea, regardless of the amount of quilting you are going to do on the project! After ripping all the seams out, the project went together a whole lot better. 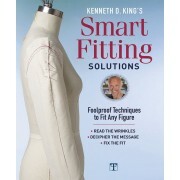 I want to start quilting this year and this book would certainly help me out in the process! 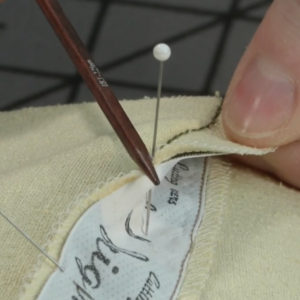 its that 1/4 inch seam, and keeping it consistent. I have strips sewed and they range from 11 3/4 -12". I even tried using a piece of tape to keep it consistent. 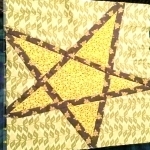 I love the look of triangles incorporated in quilts. However, I have trouble getting the points aligned properly, which is the point (pun intended) of my entry to win this book. I would love to win this book to overcome being hesitant with points so that I can move on to circles and hexagons. The fabrics I see for a Double Wedding Ring are simply beautiful. I watched my mother prepare a Drunkard's Path quilt with ease. It would be great to overcome this hesitance! Good luck to all! 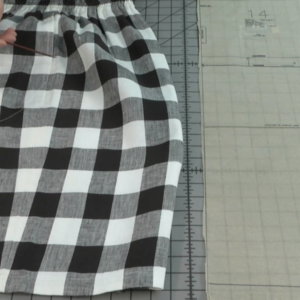 Keeping an even width when sewing multiple strips into bands and messy curved seams. Both of these problems come from trying to sew too fast. uhhhhhh, eyeballing instead of using a ruler. (bad, bad habit). I like this and thanks for sharing this information and new design!